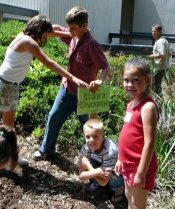 Touchstone Kids is all about showing children how wide and long and high and deep God’s love is (Ephesians 3:16-21). We use puppet shows, sing-alongs, crafts, memory verses, and of course, God’s Word. Infants and Toddlers are cared for in a quiet and peaceful setting by experienced, loving volunteers who reinforce the monthly lesson through simple songs and games of peek-a-boo. Two and three year olds learn and play in a fun environment that features hands-on learning with building blocks, play sets, and tea parties. 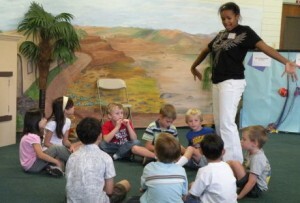 They learn the monthly lesson from Bible storybooks, from music and movement, and interactive activities. Each week, kids age four through Kindergarten learn a different aspect of the monthly theme, through super-engaging Bible stories, activities, crafts, song time, and small group time. Children in first through fifth grade get to see first-hand how God’s love for them impacts their daily lives. Through hilarious storytelling, engaging activities, and close relationships with their teachers, they learn from the Bible that the story of God reveals the character of God. That the Bible is the source of wisdom and truth. How what it says applies to their daily lives. That relationships with the people in their lives matter.